Every so often, a PC game comes along that offers a new twist, opens a previously unseen door, or turns a familiar concept on its head. For example, Tetris, released in 1987, is an almost too simple puzzle game that has become a universally popular success that has lasted through generations of gamers. The Sim City series still makes urban planning fascinating and fun 20 years later, and at the same time teaches about the balancing act we call urban civilization. 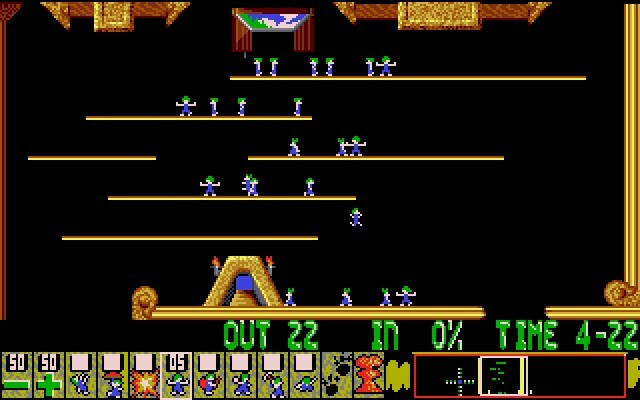 Lemmings was such a groundbreaker — simple, charming, challenging, and decidedly different. This title began a legacy that lasted almost two decades and still has fans today, myself included. We've all grown up hearing the well-worn references to lemmings, those small arctic rodents whose migration patterns often send them off cliffs, into the ocean, or toward some other means of mass destruction. We may never know why lemmings are so obdurate when it comes to their travel plans, but this game gives you the chance to save untold numbers of lemmings from their doom. 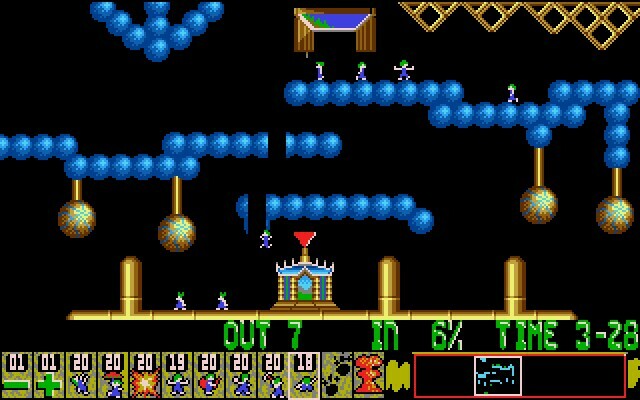 At first you'll play Lemmings because it's a lot of fun — and you'll keep playing because the little characters are so cute that you feel depressed if you let too many of them plod stupidly into oblivion. There are four levels of difficulty — Fun, Tricky, Taxing, and Mayhem — each made up of thirty different rooms or areas into which varying numbers of lemmings drop. That adds up to 120 puzzles to solve, so you're not about to finish this game off in one or two sittings. As the hapless lemmings fall into each area, they immediately begin walking toward what will quickly be their demise — unless you leap into action and direct a few of their number to perform certain life-saving tasks. With a mouse click or the press of a key, you can "teach" a lemming to block off a passageway, build a bridge, dig a hole, and so forth. You can even have a lemming blow itself up for the greater good (the poor critter sticks his fingers in his ears and explodes into multi-colored atoms). And, sad to say, there's even a Nuke 'Em option that's almost too painful to contemplate. On some levels, you may have to get by with a restricted amount of options. Perhaps you'll only have five chances to create bridge builders in order to work your way out of a hole. Or maybe you will have multiple options that must be used in a particular order to succeed — dig, then build, then block, for example. The first 30 rooms give you lots of practice at using one or more of the actions that save their lives, so you can slowly work your way toward the upper levels, where things grow frantic indeed. The areas into which the lemmings drop are quite varied and colorful, with fanciful structures and multi-leveled platforms and walkways to navigate. If you have a sound board, you'll also appreciate a surprisingly rich background musical score that changes from level to level. This is without doubt a unique and very special game environment, featuring multi-faceted puzzles imbued with subtlety and wit. 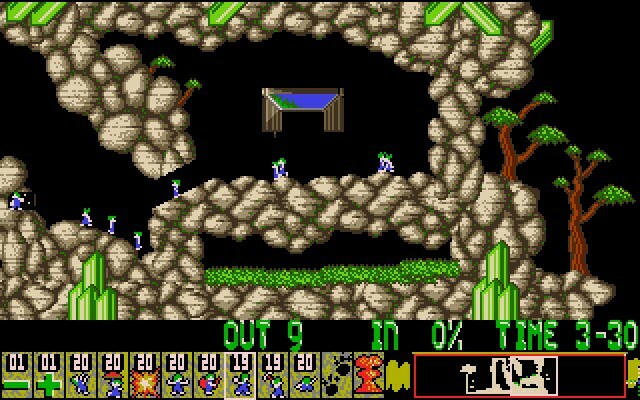 The Psygnosis designers obviously had a keen sense of humor when they created Lemmings in 1991, and they filled Lemmings with a charming sense of the absurd. This was a groundbreaking effort and has my highest recommendation. Lemmings has been installed on my various machines over the years, steadily since the early 90s, where it will remain indefinitely. 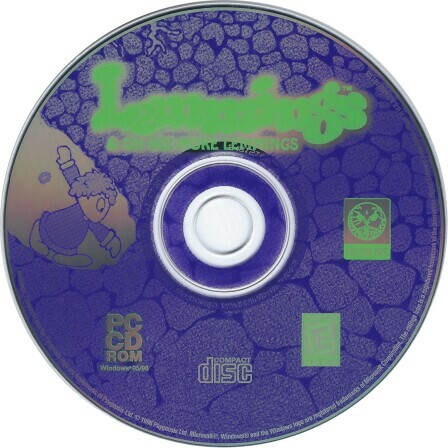 Lemmings combines easy-to-grasp gameplay, with a compelling and addictive premise that is timeless. But be forewarned. Make a simple mistake in guiding those tiny fellows, and you'll send luckless lemmings to an early grave. And you don't want that on your conscience. Oh No! More Lemmings is a great sequel to Psygnosis' famous puzzler Lemmings. In this edition everyone's favorite furry critters come with all new abilities and much more varied terrain. Oh No! offers slightly more complex situations in smaller playing fields. 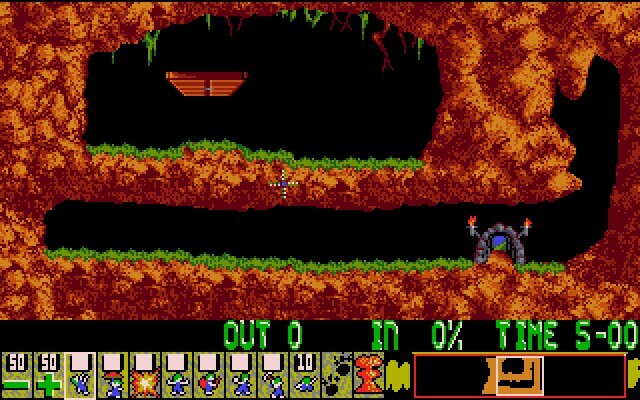 Of course, both games have similar levels although Lemmings focuses on using moreof the screen without unnatural obstacles. Regardless, you'll assign lemmings different tasks in order to escape danger; you can build steps, position roadblocks, assign jumpers, masons and the aforementioned diggers/miners. With more devious level designs, more skills, and more lemmings antics than the first game, Oh No! More Lemmings is a strong sequel that deserves no less notice than its famous ancestor does.